"During its installation and opening, AMAZE transformed the corner of Beverly Drive and Dayton Way into a playground of means rather than any sort of end. The space was gently lit by cheap clamp lamps and twinkle lights, along with a few harsh overhead bulbs to satisfy the fire department's requests for ample lighting. "Throughout the night, Farmlab fans, art-goers, and unsuspecting passers-by wandered inside and were immediately confronted with… action. Whether it was drumming with found wooden sticks on the 600-lb buoy, small children hurriedly wrapping smaller and smaller passageways around the metal framework with VHS tape, or adults cautiously placing plastic skeletons within tattered hanging kimonos, the action inspired reaction and thus the majority of guests participated in adding to AMAZE. 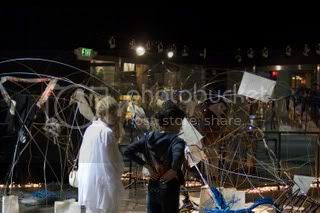 "During the course of the night, the structure grew a large quantity of new skin, even including consumables from opening night -– empty two-buck chuck bottles are now part of the installation they helped celebrate.The key aspect of AMAZE is that it presents an open, flexible environment in the heart of an orderly business district. 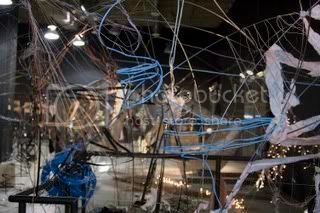 During the opening, visitors appeared to first become enchanted with the overall look of chaotic order of the maze, then got lost in leaving their mark on the structure. As it turns out, both adults and children seem to enjoy this spontaneous chance to create rather than merely consume." "...part of a larger process that's gone from mid-July until the end of August, and that Farmlab's 'piece' there is in a state of constant reaction to inside and outside forces -- be they the City, pedestrians, George, Phantom Galleries, etc. For more information about the installations, and the public workshops featuring George Herms and various highly-regarded jazz musicians -- to be held the nights of August 18 and August 25 -- please CLICK HERE.